We all know that with sunscreen skin gets damaged in sunlight. But little do we know about how damaging sun rays can be to our hair. Prolonged exposure to the sun’s ultra-violet A and B (UVA and UVB) rays can damage your hair from its cuticle to its inner structure. Here are some tips on how you can protect your hair this summer- Protecting your hair against sun damage should start long before the summer season. Drink water often to keep yourself hydrated — when you drink enough water, your hair looks its best. Use a chlorine-removing shampoo after swimming in a chlorinated pool – or add a tablespoon of baking soda into your shampoo if you don’t want to buy a different shampoo to take the chlorine out of your hair. Make sure to keep it all mixed in. 2. 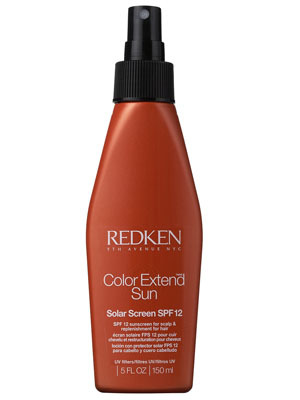 Redken Color Extend Solar Screen SPF 12 – Sunscreen for color-treated hair. Find it here. Alternatively you can makeup your OWN Hair sunscreen . Simply take an empty spray bottle and fill it with water, adding about a tablespoon of whatever sunscreen you have on hand. SPF 25 or higher is best. Shake well and spritz wet or damp hair with the homemade sunscreen and rub it into your scalp and comb it evenly into your hair. 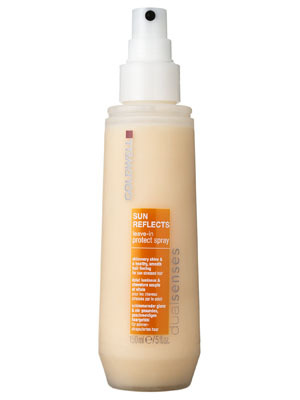 The result will be healthy, shiny hair and a protected scalp without the greasy effects.